Someone who records or transcribes (material) with a stenotype machine. 1. Shorthand in which alphabetic letters or types are used to produce shortened forms of words or groups of words. 2. The art or process of transcribing with a stenotype machine. 3. A kind of phonographic writing using ordinary script or printed letters. Phonographic writing is the art of writing according to sound; representation of words as pronounced; specifically, the shorthand system invented by Isaac Pitman (1813-1897), or a modification of it. 1. A reference to people who have set ideas about what someone or something is like: The author's plots are predictable and her characters are stereotyped individuals. 2. Etymology: from Greek stereos, "solid, three-dimensional." 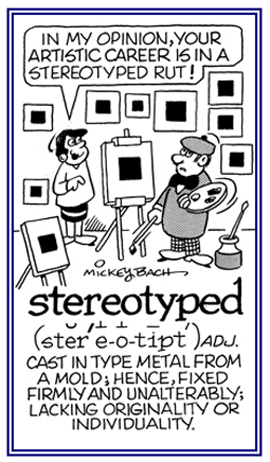 Since "stereotypers" were used to print the same thing over and over, the word came to mean any excessively repeated statements or ideas. 1. The primary type of the type species of a genus established by virtue of tautonymy. 2. The type of a genus whose species-group name is identical in spelling with the genus-group name. Tautonymy is the possession by two or more distinct plants or animals of the same generic and specific names which are prohibited by the rules of scientific nomenclature; for example to refer to an animal as a "bison" and a plant identified as a "bison weed". The type of a genus whose species-group name is identical in spelling with the genus-group name. Showing page 5 out of 7 pages of 97 main-word entries or main-word-entry groups.